Dress up your outdoor dining table with style! 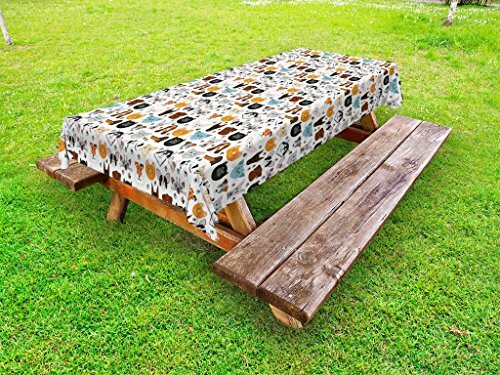 These unique designs are perfect for casual gatherings in your garden, summer tables, backyard picnics, BBQ dinners, patio lunches, outdoor parties or picnic tables. Great for everyday use in indoor and outdoor especially with your children and grandchildren. They will brighten up your table and bring a refreshing touch. With tens of 1000's of fresh and fun designs you can find the right tablecloth to match with any tableware, napkins, place mats and for any occasion and every event at home, party house, hotel, restaurant, cafe. Environmentally friendly, no dye substance harming health of your family. Colors won't fade thanks to new digital printing methods. A perfect gift idea for your mom, dad, sister, brother, grandma, wife, husband and all other beloved ones with many of surprising designs. You can find a design for everybody and every interest in our Lunarable Amazon Collection. They will be shocked by the superior quality of the item when they open the present. Customized, personalized products are very popular. As manufacturers of digital printed home textiles, we follow current trends and bring you the latest home fashion. Either a gift to your family or friend, relative or boyfriend girlfriend, or to yourself, the item should be interesting and authentic. CARE INSTRUCTIONS: Machine wash on cold delicate cycle with mild detergent and water; Do not bleach. Due to manual measurement, please kindly allow 1-2 cm discrepancy. The digital images we display have the most accurate color possible, however due to differences in computer monitors, we cannot be responsible for variations in color between the actual product and your screen. 58 INCHES WIDE x 104 INCHES LONG - Spill proof and waterproof. Perfect for outdoor and indoor use. MADE FROM - High quality 100% polyester fabric with hand-sewn finished edges. VERY DURABLE. EASY CARE & USE - Machine washable on cold cycle. Stain resistant and long lasting. NO FADING. CREATES - A wonderful, unique setting for your family and friends to enjoy together. Versatile. FUN. PRINTED - With state of the art digital printing technology. No dyes harming health of your family. If you have any questions about this product by Lunarable, contact us by completing and submitting the form below. If you are looking for a specif part number, please include it with your message.